There are no examples of complete sets of clothing that have survived from Viking Age Scandinavia, or other European areas inhabited by the Viking peoples. Knowledge of how the Vikings dressed must therefore be pieced together from a variety of sources. Depictions of human figures are fairly common in Viking art, including jewelry, such as cast figures intended for use as pendants, on wood and stone carvings, and on the very few remnants of Viking Age tapestry that have survived. Descriptions of clothing are sometimes found in Viking sagas, and fragmentary remains of fabric plus metal accoutrements for clothing, such as brooches, buckles, etc., have been found with bodies in Viking Age burials. Problems exist with the reliability of each of these sources. Viking artwork, including its depictions of human figures, tends to be very stylized rather than realistic. Because most of the existing sagas were not put into written form until the thirteenth century — although presumably they are based upon oral tales and poems from the Viking era — a risk exists that descriptions of dress may more accurately reflect styles of the time when the stories were memorialized in writing, rather than the earlier period when they are set. And because fabric finds in burials have been mostly of very small scraps of garments that escaped the destructive processes of decay through quirks of proximity to some other material that protected them, identifying the size and style of garments that once adorned the excavated bodies depends heavily on educated guesswork. 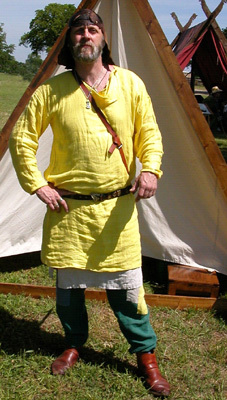 Nevertheless, the combination of these sources has allowed us to create a picture of how the Vikings probably dressed. Three fabrics are known to have been used by the Viking peoples to make clothing during the Viking era: wool, linen, and silk. Fur animal pelts were probably also used by the Vikings to make cold weather outer garments, and as accent trim on items such as cloaks, for it is known that fur pelts were a trade item exported from Viking Age Scandinavia. Wool cloth would have been widely produced locally during the Viking era. Most households probably possessed a loom — large, upright looms were typically used in Scandinavia during this period — although evidence exists that wool cloth was also sometimes produced commercially. Archeological evidence from the town of Ribe, a trading center during the Viking Age located on the west coast of the Jutland peninsula in Denmark, suggests that weaving of cloth was done on a production scale there. Flax is known to have been grown in Denmark and parts of Sweden during the Viking Age, so linen was almost certainly produced in those countries, although it is probable that linen cloth, which is believed to have been quite popular for clothing, was also a trade good which was imported. Silk certainly was imported, probably via the eastern trade routes running from Sweden down along the rivers of Russia to the Black Sea, Byzantium, and the Arab kingdoms beyond. From traces found in Viking burials, it is known that women and men’s clothing was sometimes decorated with trim of ornate woven braid. Silk was popular for decorative trim, and threads of gold and silver were woven into the pattern of the decorative braid in some examples that have been found. 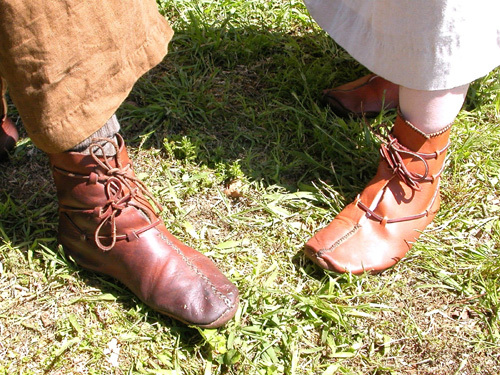 Footwear for both men and women would have been made of leather, and complete or partial surviving examples of a number of different styles have been found, ranging from simple, so-called ‘skin shoes,’ made of a single piece of leather that was pulled up around the foot and laced together on top, to shoes with uppers made of several pieces of leather sewn to separate soles of a heavier leather, and even ankle and higher boots. Viking era ankle boots, recreated based on examples from archeological finds. Although virtually nothing is known about the type of undergarments women or men wore, the innermost layer of clothing worn by women that would have been outwardly visible would have been a long, straight chemise or shift. Among women who could afford a finer quality of cloth, for comfort this garment was probably most often made of linen rather than wool, and was sometimes sewn with numerous fine pleats for decorative effect. A sleeveless outer dress would have been worn over the chemise. Several different styles for the construction of these outer dresses have been suggested, including a simple ‘tablet’ dress made of two rectangular pieces of fabric, a single long, rectangular length of cloth that was wrapped around the body, or a straight sewn tubular sheath. All of the suggested styles had in common, though, that they were suspended by straps over the shoulders, which were secured in front by a pair of metal brooches. 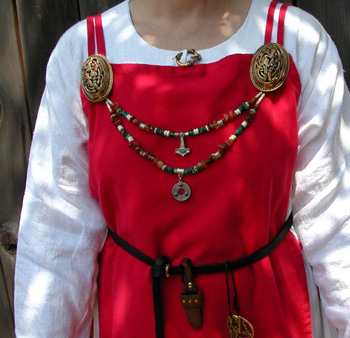 Viking era woman’s tablet style overdress, worn over a simple linen chemise. A pair of large brooches were typically used to fasten the straps of the dress in the front, and based on grave finds, a small brooch was often used to secure the neck of the chemise. Small household items, such as keys and scissors, would have been worn on the belt, and extra jewelry, such as the beads worn here between the large brooches, was also commonly worn by women. A Viking era woman might also have worn a shawl or short cape, if needed for warmth, and some illustrations found in art suggest jackets were sometimes worn over the chemise and dress. Men’s clothing would typically have consisted of trousers and a tunic, plus a cape fastened at the left shoulder with a brooch if needed for warmth or protection from the weather. Trouser styles varied: in the western Viking lands they typically were straight-legged, though could be fitted either somewhat loosely or relatively tightly to the leg, but in parts of Sweden and among the Rus, trousers were sometimes worn in a baggy, even billowy eastern style. A knife would typically have been worn at the belt, as well as a pouch to carry personal items, such as a comb, or flint and steel for fire-starting. 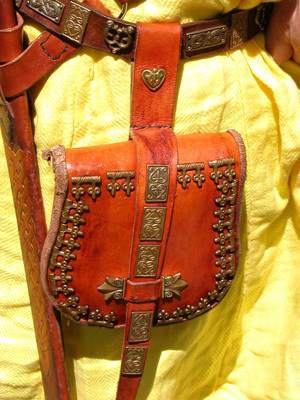 leather accessories such as belts and pouches were often elaborately decorated. In the Vikings’ culture, it was common for both men and women to wear jewelry. 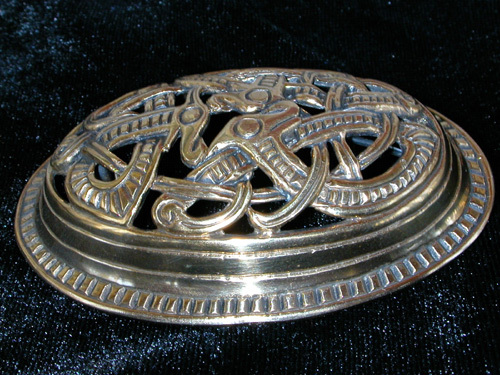 As previously stated, pairs of large brooches, used to fasten the straps of the over-dress, were typically worn by Viking women and are commonly found in their graves. Beads of glass, crystal, amber and various metals were also common, worn as necklaces or in strands hanging between the pair of brooches. Bronze tortoise-shell shaped woman’s brooch, of the type typically worn in pairs by Viking era women to fasten the straps of the outer dress worn over the chemise. Men and women frequently wore pendants around their necks. Thor’s hammer pendants were very common, and considered a good luck charm, although other designs were also popular. Neck rings, arm rings and bracelets of silver or sometimes gold, depending on the wealth of the wearer, were also common items of jewelry for both men and women. 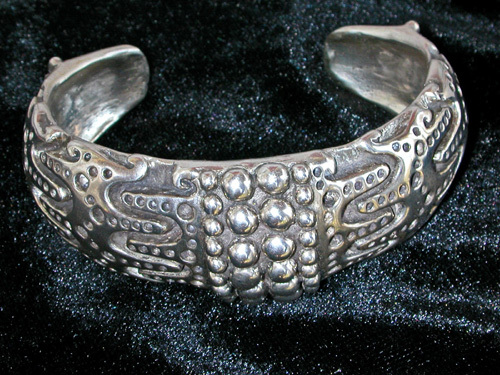 Copy of a man’s silver bracelet found in a Viking era Danish burial. Personal grooming and cleanliness were valued in the Vikings’ culture. Representations of women often show their hair worn long, but knotted at the back of the head, and men’s beards and mustaches are depicted as carefully trimmed. Combs were a common personal possession for both sexes, as well as small implements used for cleaning the teeth and ears. English observers during the Viking Age recorded their surprise at how often Danes combed their hair, bathed, and changed their clothes, and the Havamal, a collection of Viking sayings and poems, advises that a host should always greet a guest with water and a towel for washing.